So, I just discovered this blog, and I have to ask… Are you a wizard? I cannot fathom any possible way to create such delicious breakfast-based beauty outside of the dark alchemical arts. Seriously, I'd love to know your secret. And this is how I put my wizarding powers to use? Ha ha. The secret is a baster with a little nozzle that came off of an air pump. I figured you'd have some sort of tool like that but all I can say is WOW. I can't even draw that well with a PENCIL let alone make pancakes that are that well-done, you are an artist! Okay, I'll be really honest, I can't even make regular ROUND pancakes that well. Haha. Thanks for the kind words! 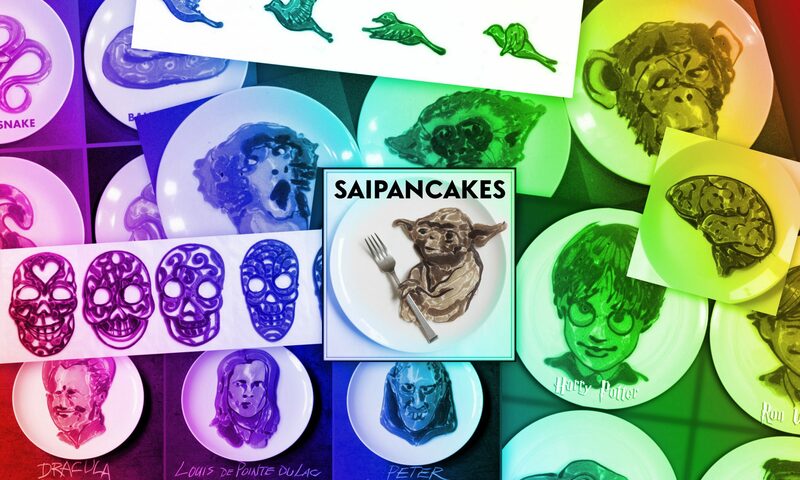 So far only one ugly pancake has been submitted – maybe one of your readers will win! I find it fascinating to be able to track your progress. Starting with very simple flapjacks, as many parents do but then taking it to new heights as you developed your technique. You might consider a How-To book for kids and adults. They, and kids' books are among the easiest to get published. Thank you – I'll be waiting. So far we have only 3 submissions!